So with that all being said, I was curious if the engine cases are in fact interchangeable between 1974 internals and a 1978 case? I currently have a cracked 74 CB750 motor with great internals and a 1978 cb750 case in great condition; so before spending the efforts I figured I would get confirmation before really diving into swapping the parts over. It doesn't appear that the changes would have been significant but I just want to be sure I am not overlooking something. That will work. just keep all the trans components the same. The single row final drive will produce a little more power, but plugging the chain oiler is a bit of a pain. If you have the 78 crank, and bearings that makes things a bit easier. You are going to have to play around with the crank bearings a bit to make sure they are not too tight or loose. Best to tighten each of the crank fasteners a little a time then turn the crank on the rotor to make sure nothing is binding up. If just one bolt is binding you can loosen it a bit. So long as you have 12ft on that bolt you will be ok. If you are swapping cranks, plastigauge the bearings, or at least compare the case markings from both sets. The '78 case and it's counter-shaft mount the drive sprocket 10mm further out than the '74, so the chain alignment will be off. There are ways around this, such as an off-set rear sprocket. It may be easier to seal the crack than to swap cases. Pretty sure the shorter shaft fits in the late cases..make sure final drive shafts and gears match. The case itself and the seal stick further out than the early case, so I don't know if the shorter shaft will work? I thought the later cases used a wider bearing at the output shaft as well? 73 and later , wide bearing i believe. Years back I put a 77K in a 72 frame..
After a while I noticed the sprocket shining one side only, and opposite on other end. So I put a straightedge on it and holey #*@+)$. So since that point around 81 , I knew. My buddy had gotten a nice black F motor, and it was on display... Wanted to maybe use it someday.. When he found out about the shaft being longer, he was upset..I told him it was longer. He worried about it so much, he ordered a new short shaft, and split the cases and installed it.. The seal say sunken in, but I think it all works. He was not willng to grind seal boss down.. It still may be easier to seal the crack. 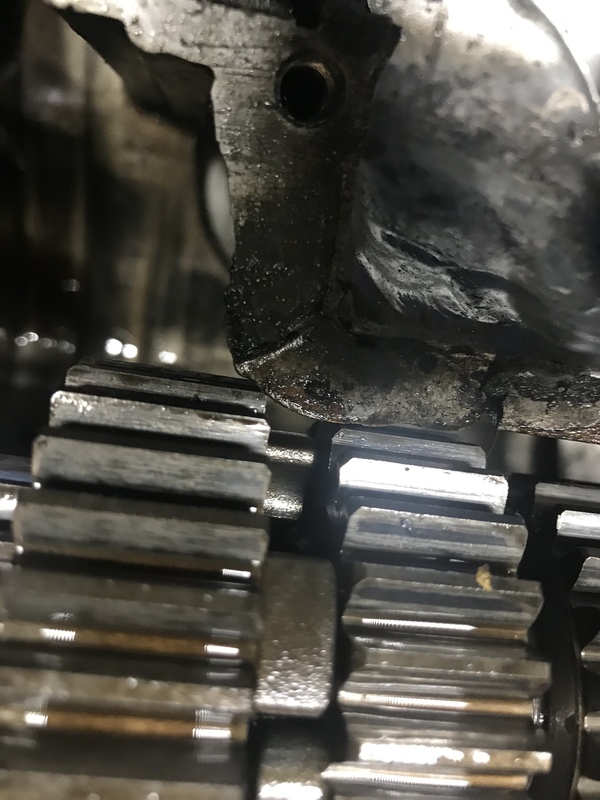 74 CB750K shows a full bearing retaining ring on the fiche while the 78 CB750K shows a half moon retaining ring. The bearings have a different part number as well. I'm pretty sure I've seen a thread where it has been done, I just don't recall the particulars. Jimmy is wanting to swap out all of the internals. What you describe Frank is just swapping out the output shaft only. I would have to do some careful measuring before I could say one way or the other. Like I said, I think I've read about this scenario, I just don't remember exactly what was done. Maybe swap out all of the internals with the exception of the output shaft bearing? Your last sentence is what I meant , but you can use the shaft, one of the bearings, but i think the gear has to come off and switched to 78 style. Why not leave the 78 long output shaft in and just change the sprocket carrier? 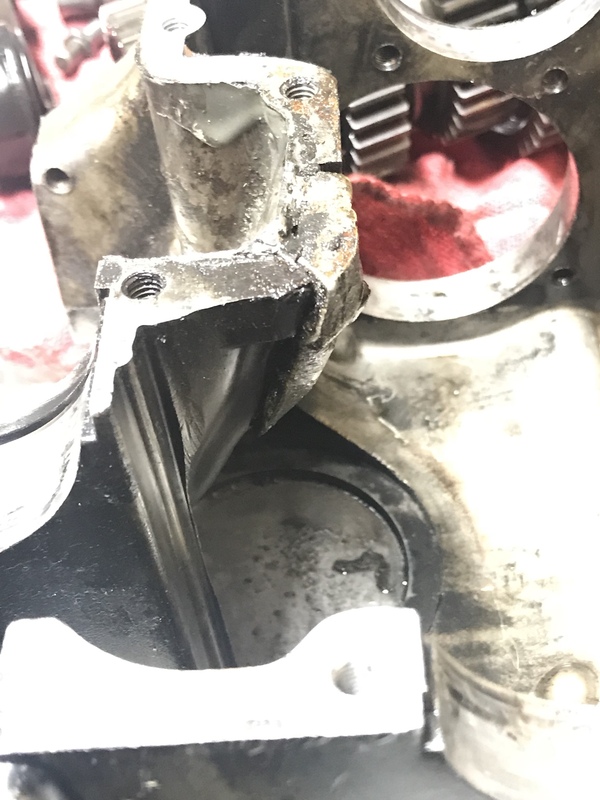 Stock chainguard probably wont fit. 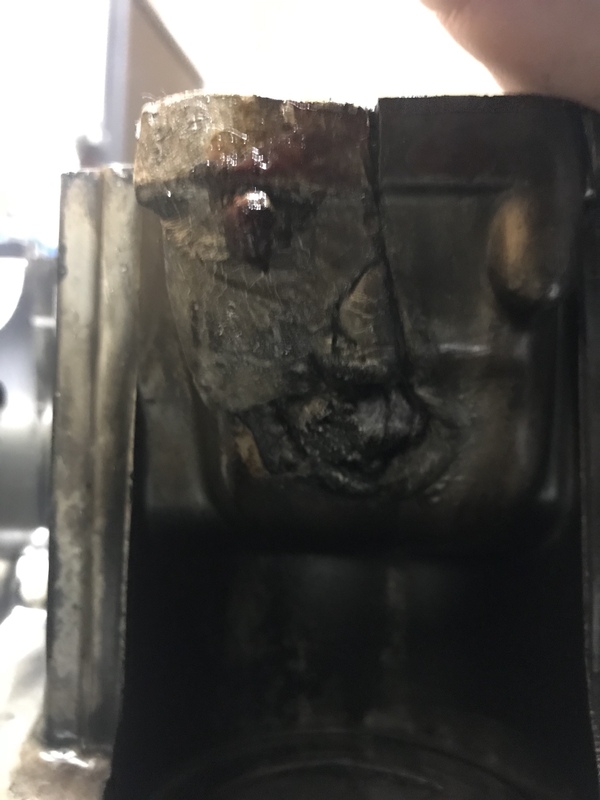 To be honest, I was surprised my buddy changed shafts, on a low miles spare motor sitting on the bench, i think he even sprung for OEM shaft. Pretty sure the angle issue with the rear shock is if you use a 78 swingarm. Agree with the chainguard.......chain comes closer to the left shock, but doesnt touch on mine. May depend on your shocks. Maybe ya'll can get Spanky to post pictures of the top shock extension kit I made for him. Works very nice IMHO. Yes, indeed it does. That requires swapping out the swingarm, the rear sprocket carrier, the chain guard, and the wheel spacers, provided the longer output shaft from the 78' motor is used. I get the impression that Jimmy is just looking for a way to swap the 74' engine internals into a 78 engine case with minimal fuss (i.e. additional parts and $$$) and bolting it back into the 74' frame. Depending on where you are located Jimmy, maybe someone in your area can swap a 74' case for your 78'? Wow this thread certainly took off - but madmtnmotors nailed it on the head. Essentially I'm looking to eliminate as much fuss as possible with what I have on hand (if something pops up locally (NY) I would certainly entertain the thought). Unfortunately the 74 case at some point was welded (or I should say an attempt at welding was made) by a p.o. The result? A mound of material, a complete eye sore, and something that still leaks which is why I wanted to try and start fresh. With that, I had hoped that the swap would be painless but from the sounds of it based on everyone's contributions, it sounds that I may have a couple different options to toy with and see where everything lines up. The other changes with the motors from the research I have done seem to be negligible. Some shifting improvements and other tweaks but nothing that should introduce major implications. 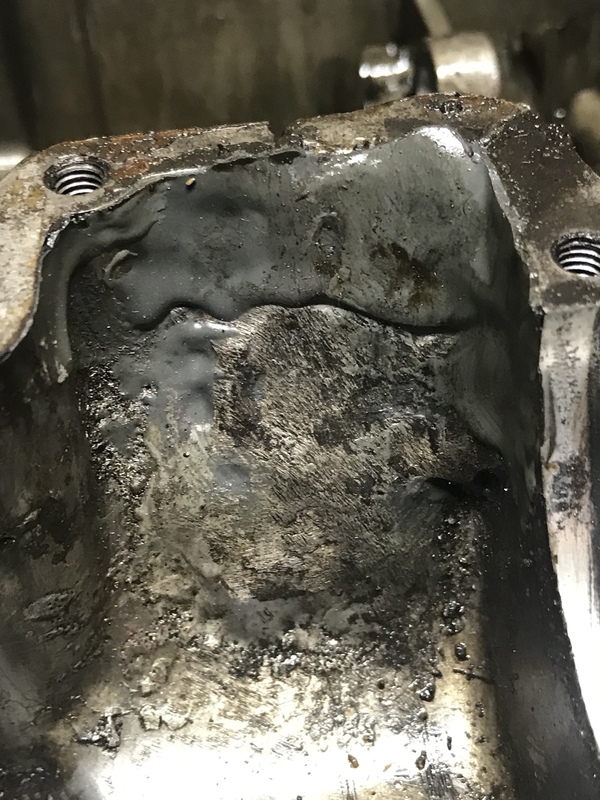 Don't discount the option of merely sealing the leak, especially if the motor is currently assembled and running. My motor had a leaky welded repair from chain damage, and I fixed it with a piece of aluminum glued on with RTV. Please post some pics of the area in question.. I'm wondering if I would have the same issues trying to use 74 cases on my 72. I read through this whole thread and didn't quite get my answer. If anyone knows, please let me know. That would be a good straightforward swap. There are 'early' and 'late' K2 engines. The 'early' ones (mostly before 3/72 production) had a single-row output shaft bearing and the bearing seat in the case is narrower than in the K4 cases. For a brief while in the late K2 and Old Factory K3 cases, this bearing seat was made a little wider than in the K4 and 2 grooves for the 2 different types of final-drive bearing retainers were cut into the cases, presumably so the production techs could install either one that day, depending on which parts they had on hand. If you have the late K2 with the wide 2-row output bearing, it will drop right into the K4 cases. If not, you will have to obtain either the K4 final drive shaft or the late K2/K3 output shafts that resembled the K4 version, but had a spacer installed on it when the case had the narrow bearing seat. Some have gone so far as to take the K4 shaft and make their own spacer, when the case had the narrow bearing. If you have my book, take a look at the final-drive section(s) and you'll see the differences. Would you be able to tell by these pictures which one I have? I don’t have your book but I’m ordering it now. Those are the late style, like the K7/8 and [most of the] F2/3. If your engine number on the top case is parallel to the cylinders, it is likely the K7 or later F1 type. If it is perpendicular to the cylinders then it is the last year of manufacture: the final-drive shaft and bearing (and seal) from that type seldom fit the other cases very well. But, the final drive shaft and bearing can be easily swapped with a similar version (I have several) that will let you use a little earlier case if needed. All this said: I am currently in the process of repairing some K0 (very early) cases that had a chain accident. It's expensive, running about $400 so far, but I think it will come out OK in the end. It takes time and patience, and expert welding and machinists who care to get it right. I am blessed to know a few of these around here! As this thread is very timely for me, I'll hop in, if you don't mind. I recently purchased a K8, and decided to replace the worn chain, and found a large hole that had been covered with a coke can and fibreglass! I can source a K6 cases in good nick, and my question is will my K8 internals fit into the K6. I have made a better repair that is ok and oil tight,so the bike is rideable now, but will jump on the cases if the collected wisdom on this invaluable site is to go for it. Thanks in advance for any suggestions/ help. Considering the K8 had the better chain that is pure PO neglect. Check the part numbers for the respective output shaft bearings, if they are the same chances are good cases will swap. You can run the K6 cases with output shaft, if you can live with chain closer to wheel. You would need k6 sprocket carrier and spacer, chainguard may not fit. I think you can transfer the late output shaft into a K6, but you should check with a set of cases. The gear set driving the output shaft, on K7 and K8 have different tooth counts than K6 and earlier. Yes I agree that it was a lack of basic maintenance that caused it. Thanks for your replies. I'll check the cases and see what they are like. As I am able to wait, it will be best to have patience and find the right cases or engine. Either way I will leave it a better bike than I found it. Don't know if it will help , I assembled a bottom end yesterday using 72 cases with 78 trans. The only change needed was I installed the bearings and gear from the 78 on the 72 out put shaft. Dropped right in. oz750, where are you located? I have a set of K7 or K8 cases I could probably part with. I have both, one has broken mounts one looks good. Can't remember which one at the moment. They are in storage right now. Thanks Smac. I am in Australia, but happy to pay freight over if cases are good. Thanks again for help. It's -25 Deg C here - I'll try to dig it out in the next couple days and send you some pics. OMG I can't even imagine that! I hope you don't have to go outside.Much appreciate your help. This is what I know to be true . I have a 72,77,and 78 engine. I just finished the 72 bottom end using the 78 trans. The only thing needed was to change the output shaft gear on the 72 shaft using the 78 gear. The same is true in reverse order,early trans to late cases. I compared 4 output shafts,the bearings are the same as is the over all length. The gears are different as is the placement of the outer double row bearing. It stops around 1/4" sooner [closer to shaft end] on the 77/78 than the early style 72 does. In short you must use the shaft for the cases you have and the output shaft gear for the trans you are using. Everything drops in with no clearance problems.